A 62-year-old female presented to our practice. She previously tried to wear contact lens, but without success. But contact lenses for distance vision are her preferred option, potentially RGP or soft. Slit lamp: Cornea: ODS; clear without infiltrates, the conjunctiva ODS looks normal. Tear film stability (Break Up Time, BUT): OD ± 8 sec OS ± 5 sec. Corneal astigmatism does not fully meet the refractive astigmatism. A toric soft lens is this case indicated, as the RGP lens would induce a corneal cylinder. At the 1 week follow-up visit, the patient reported a decrease in vision. She also reported increasing haziness in their vision during the course of the day, as if there was a veil or coating on the lenses. On measurement the visual acuity was significantly lower than at the initial visit. The fit was assessed with the push-up test to see if there was sufficient movement to ensure tear exchange and this was normal. It was decided to supplement the care with an intensive cleaner every day to deal with the lenses. At the subsequent follow-visit 1 week later, there was no improvement in the visual acuity and the lenses continued to fog up during the course of the day. Push-up movement was limited at this point noticeably, with virtually no digital displacement. The conjunctiva appeared oedematous and hyperaemic. The lens edge was seen to sink deeply into the conjunctiva. At this point, it was decided to do a soft lens refit using the Eye Surface Profiler to obtain a full ocular surface map with the horizontal ocular sagitta (OC-SAG) and to use that information to select a better or potentially custom made lens. Eye Surface Profiler measurement (figure below) revealed that the 15mm horizontal chord OC-SAG for the right eye our patient was 3620miron. For comparison, the average horizontal 15mm OC-SAG is 3750micron for the normal eye. The OC-SAG over a given diameter, to match the potential soft lens sagittal height or CL-SAG, can easily be derived from the Eye Surface Profiler. The OC-SAG over a 14.5mm chord for this right eye was 3400micron for the horizontal meridian (slightly higher for 360 degrees at 3450micron) – to be in line with the 14.5mm lens diameter of the prospective lens. In hindsight, was the CL-SAG of the original fitted lens excessively large for this eye (the CL-SAG of a AirOptix for Astigmatism is 3885 micron) – a difference, or delta-SAG, of 485micron. For the left eye, these numbers were similar, but the difference was less excessive: the 15mm 360 degrees OC-SAG was 3760micron – the 14.5mm chord (to match diameter of the prospective lens) was noted to be 3530micron – hence a delta-SAG of 355micron. A new lens was chosen based on the Eye Surface Profiler OC-SAG measurements: the Purevision for Astigmatism has a CL-SAG of 3493micron*: equivalent of a delta-SAG of 93microns for this right eye (and a delta-SAG of 37micron for the left eye). The exact ideal delta-SAG for a soft contact lens still has to be established, but based on work by Young and Van der Worp it appears that a ‘slight edge strain’ (Young) of 2.7% where the CL-SAG is slightly higher than the OC-SAG (in access of potentially somewhere in the 0-100micron range) could be enough of optimal or adequate lens fit. This would generate enough ‘grip’ of the lens to prevent excessive movement of the lens on-eye upon blinking – without generating any excessive mechanical pressure points and the described epithelial changes (Van der Worp/Molkenboer). At the first follow-up visit, the patient no longer had any complaints about her vision and the lenses no longer fogged over, with the patient achieving 10-12 hours of wear time. Headaches had also fully resolved and her VAs wee 1.1 and 0.9 OD and OS respectively. The fit was good, and movement upon push-up test was optimal. The conjunctival oedema and hyperaemia were completely resolved. Consequently, it was decided to continue with these lenses and care regime and to schedule a follow-up visit for four weeks later. 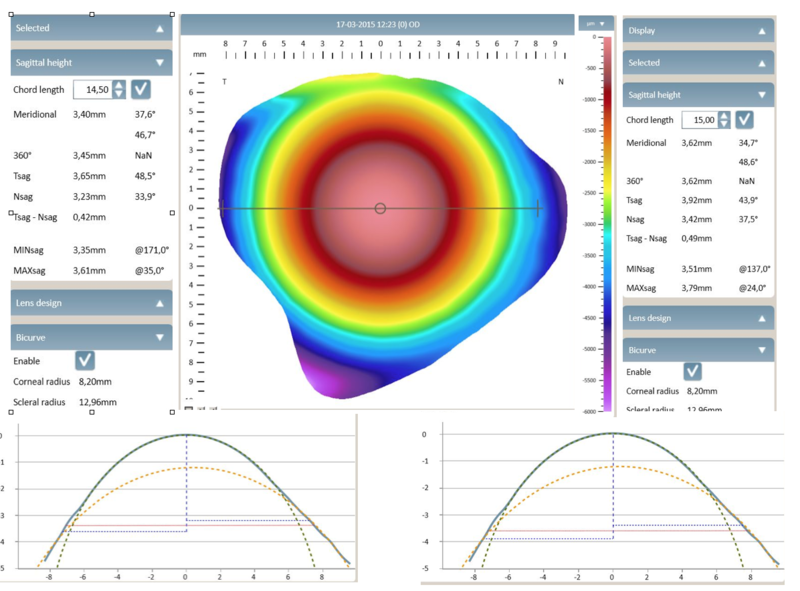 The new Eye Surface Profiler is able to measure the entire ocular surface, beyond the corneal borders – a unique feature up to date in the field of analyzing topography and shape of the ocular surface in contact lens practice. With the given instrument and information, eye care practitioners can potentially better match the lens with the eye. CL-SAGs of different soft lenses have been made available recently – although a wider range of the CL-SAGs of the arsenal of lenses available on the market is needed. Potentially the manufacturers can provide this and/or new instruments are available now to measure the CL-SAG of excisting soft lenses, and their design. Startlingly, we don’t quite understand soft lens fit and its behavior on-eye very well. As for soft lens fitting, we don't actually fit these lenses anymore but are selecting a lens at best. Keratometry values (central or peripheral) do not predict soft lens behavior on eye very well (that is an understatement). With the limited range of soft disposable lenses available on the market recently, as a result of bulk manufacturing techniques, in essence eye care practitioners are looking for eyes that best meet the currently available lenses, rather than measuring and evaluating the eye and finding a best lens that would fit that eye. As shown in this case, topography that is limited to the cornea alone does not reveal the information needed to fully understand ocular surface shape that is needed to fit larger diameter lenses such as soft and scleral lenses. It is pure speculation at this point, but the reason for the patients’ negative contact lens experience in the past could have been caused by the same problem: a disconnect between the OC-SAG and the CL-SAG. Even the proposed ‘dryness problems’ in the past could potentially have the same origin: for lens wearers, and even eye care practitioners to some degree, symptoms of discomfort are easily regarded or summarized as ‘dryness symptoms’. The huge drop-out rates, currently seen in the contact lens industry – which leads to a status-quo of lens wearers (in many developed countries it is not significantly increasing nor decreasing) could be in part due to misalignment of the soft lens with the ocular surface. New insights, and more importantly, new instruments such as the Eye Surface Profiler can help eye care practitioners to optimize the lens fit and the lens experience for the patient. Kees Broos graduated from the Christiaan Huygensschool (optics) in Rotterdam in 1981 where he also completed the MBO Optometry and Contactlens Specialist courses. In 1997, Kees graduated from the Hogeschool van Utrecht (Optometry School) in the Netherlands. Since 1986 he has been active as a contact lens specialist and optometrist at Contactalook te Eindhoven (the Netherlands). 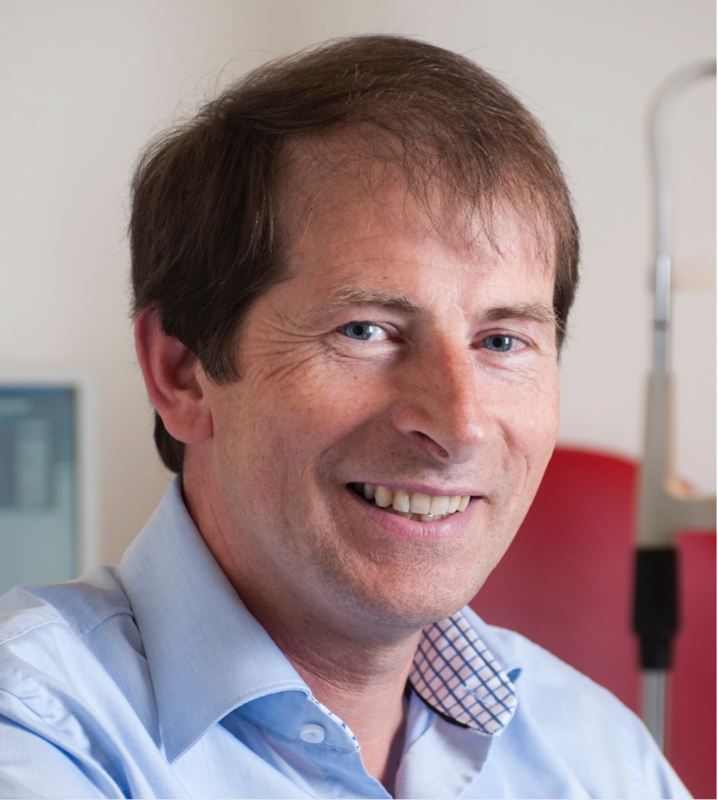 Kees is a key opinion leader in the Netherlands for a variety partners in the contact lens industry, including Bausch+Lomb, CooperVision, and Johnson&Johnson, and is a consultant for the Dutch specialty lens lab UCO, experts in the field of orthokeratologie, mini-scleral and multifocal lens applications.